Clarene McNeal twirls a baton Wednesday morning at SourcePoint. McNeal twirled the batons after she played piano in the SourcePoint Elastic Band. As “Pine Cones and Holly Berries” by The Osmonds begins to play over the stereo, Clarene McNeal starts swirling two batons with red, white, and green ribbons attached to them. As the song transitions, she gracefully puts down the batons and picks up another baton, this one with green glow sticks on either end. She begins twirling them again and the green glows are blurs at the ends of the spinning batons. After a moment, she puts down the glowing baton in favor of two shiny red, white, and blue batons and begins twirling one in each hand. As the song crescendos, she begins tossing the batons in the air to the beat of the song. She catches the baton right on the final beat of the song and strikes a pose. The crowd at SourcePoint, who stopped in the middle of their lunches to watch McNeal, gives her a big round of applause. 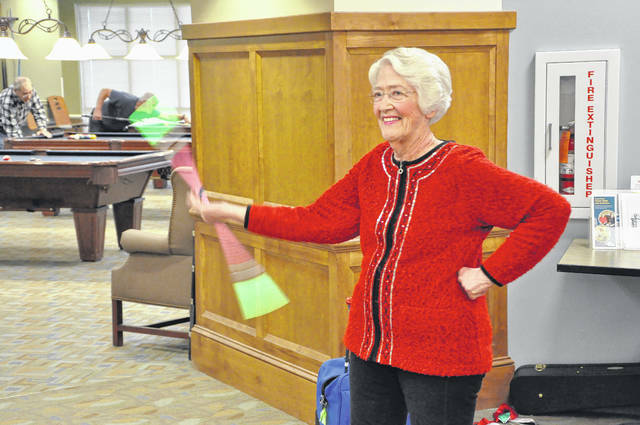 McNeal, a Delaware resident, said she has been twirling the batons for 65 years and performed a short routine Wednesday at SourcePoint. She also plays piano in SourcePoint’s Elastic Band. McNeal said she has been teaching the baton and piano for 55 years and ran her own 200-member baton corps, the Suncoast Twirlers, in Florida for years. McNeal said these days she keeps her routines more or less the same, but does adapt them to go with the music as much as necessary. McNeal says she still enjoys twirling, but doesn’t teach it anymore.